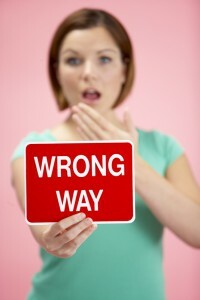 Are YOUR 2012 Small Business Goals All Wrong? I hope not – but I see this over and over again. Business owners are sold all the wrong goals by people who make a living doing what is easy instead of what actually works. Probably the majority of agencies and consultants offering services that provide little benefit – if any – to your business really don’t know any better. Others are simply more concerned with making a living than they are with your results. is NOT a goal that will convert to sales or leads! Far too many people are paying to “increase followers by x amount” or “get to x followers” and the easy way that is done is to just follow whoever will follow back. Except for the illusion of importance, how many followers you have is irrelevant. You should NOT focus on how many followers you have – focus on finding and interacting with followers who are interested in what you to offer! How will having those specific followers or fans achieve your PRIMARY goals? not some fuzzy ego-driven goal to be more ‘famous’. You must get really clear on what results your actions are intended to produce and then focus on doing only those activities that will eventually – and it does take time – lead to increases in REAL BUSINESS, i.e. sales or leads. NOT a relevant business goal. What you expect those blog posts to ACCOMPLISH (more sales? more clients?) is the real goal as I explained in my recent post on Why QUALITY is More Important than Quantity. Increasing traffic to your blog or site is a weak goal if that traffic is not TARGETED to real people interested in what your business has to offer. What content you create and how you promote it is more important than how many posts you publish. while simultaneously offering only the highest quality content. higher search positions AND by attracting real people. The traffic you don’t drive through publishing less often can more than be made up for by promoting your very best content. See How to Succeed by Sharing QUALITY Content When Others are Most Receptive for exactly what content you should be creating and what to do with it once you have it. A goal to have x guest posts published is NOT an end in itself. WHERE you are published is vastly more important. You want to place excellent content where your target audience already is. What do you want those guest posts to do? Raise awareness? Bring real people to your blog or business? Plant the seeds of relationships with potential customers, influencers, and related businesses? Many SEOs focus on writing quality content to get published on blogs like this one so they can add a link or two in the bio because they are focused on link building to improve search engine positions. where real people in your target audience will read it. and far more effective for link building as well. when you can do both at the same time? At some point common sense must kick in and at least some of us will stop playing these silly link building games. We all know that people write content to get links. What we need to do is be willing to publish content ABOUT products and services we and our readers would actually be interested in! Do YOU know what you are really trying to achieve? If you are not sure you need to get some assistance to figure that out – and the sooner the better. This is such an urgent need that I created a new Small Business Mentoring program. <<< Read more about it at that link. personal one-on-one mentoring in any skills you need. Social Media and Internet Marketing Strategy. hope you will read that page and be in touch – for your sake. As business owners, beware of people who give wrong information on how you’ll run your business. Also, always consider business goals that have long-term benefits. Your post is so great. It is full of tips on how to have a successful business. It makes people realize a lot of things. It is really important to have a right goal in order to have a right outcome. After reading your article I feel I really need to reconsider my business goals thanks for the article. Great insight on setting business goals! Basically whatever it is that naturally drives our desires for our small business is exactly what is hurting us, for example, goal for x amount of posts. Your readers may want to know they can register a domain and purchase web hosting from Speedy-Joes. Writing based on quantity rather than a quality is a big NO NO for businesses. Most especially if you are looking forward to a better business because you need to focus on what’s your client’s needs rather than anything else. From now own-wards Ill write quality post. And very nicely explained article. Hey! This article is full of great tips. I was so concerned in doing as many things as I could to promote my websites that I forgot to check if I do anything wrong. I agree with the spirit of the post. Sales are sales, money is money and fame is fame. The only important is the second one, all the others are “spirituals”, but business is business and results the only objective. Agree with you in general. Agreed that the primary goal should be business oriented and something tangible. While “Writing x number of blog posts” cannot be a meaningful goal, it can definitely be a way of achieving a meaningful goal. At least having a goal like this (which is not exactly a goal but more like a process) would result in taking action in the right direction which in turn might produce desired result (as a by product). I couldn’t agree more. Bigger isn’t always better in many cases. Like Andi said, it’s all about the quality. I’d rather have 100 twitter followers that are ideal prospects looking to soon make a move than 1000 followers that are just looking for a follow back. Couldn’t agree more with you, if your ‘goal’ is to increase your Twitter followers for example. Then that purely means that there are more people to see you fail. about goals, what do you mean by “strong”? effective? I think it’s more important that the goals are reasonable. You can pump your ego every morning looking at the mirror, but if you can’t reach it, you can’t. You waste your time, and then you think to be also mediocre (but it is not true, you just have chosen a wrong goal). Quality is more important than quantity in all blog or site. Good quality always carry the most number of followers. Thanks for posting this quality blog. You are right! Knowing and accomplishing goals is important, but it’s ALL very ineffective if your goals are just not strong enough. You’d end up wasting so much time and resources, which could be very well invested in stronger and more effective goals. Thanks for the reminders. As always, loved reading everything you said. Great blog. I feel that there are so many goals that business trying to accomplish that they are just more distracted and unfocussed. When setting goals you most be SMART. SMART goal setting allows you to focus your efforts by helping you rule out actions that will not contribute to achieve the goals you have set. Morover, you need to understand the role of our personal goals in the success of our business. Thanks for this tip.i’m also so obesesse with my twitters,facebook followers that i ignore the potentials of my blog earning me more money.thanks alot.i really do appreciate this blog. Happy New Year! Some great points there. I have shifted from counting my followers on Twitter and Facebook to seeking real customers especially some right here in my community. Also, I have seen improved increase in my websites income, but not much in my social media count. This means that people are finding and interacting with my website, while totally ignoring my social media plight. I know that there are people who will just take one look at the number of followers and decide whether you have something to offer them or not. So, the count does matter, but not nearly as much as the sales/leads. Genie would love you to read ..Happy New Year! Welcome 2012! I have corrected these mistakes last year. Now I am looking for something big in 2012. I think that the reason people get caught up in these “vanity metrics”, I can’t remember where I read that phrase, is because they are easy to measure. They also sound impressive and don’t require explanation. If you only have a limited amount of time to discuss how your campaign is going with executives telling them that you have more traffic, more followers, more blog posts sound good. However, I definitely agree that you should focus on how your actions impact sales. In many businesses this means quality visitors that produce strong leads and sales. 2012 goal, here I come. I hope everything will work as planned. You’re absolutely right. We should always consider the end goal of leads/sales/customer vs. just ranking, or visitor count – without conversion they are meaningless (unless you’re an advertiser proving page views). For 2012, I think it’s important to further promote yourself as a brand, especially if you have multiple niches you’re involved in . we just need the end of the economical crisis and a new economical expansion. this will multiply the number of internet visitors and page views, I’m sure. important is obviously you can reach it focusing on it and with your skills, need concentrate and focusing Timing, will result in what is truly Even bloggers should be thinking about. i appreciate that and very hopeful. thanks for sharing info. I agree with your point on GUEST POST. Having X numbers of guest post will never help unless that blog has high traffic and has high domain authority. An article published on ezinearticles will help 10times more than it will do on a decent blog. The Twitter followers and blog ideas were on my goal list for 2012 as well, but now after reading your post I have had a big rethink.about what I really want. But after the re-think, I want to question you about what needs to be done in your view to increase the visibility of a blog. Twitter and blog followers ensure more reads for your blog. The way to make money off blogs is if more people look at it which will increase advertisers and SEO’s interest in your blog which is what every blogger wants at the end of the day. So what is you alternative? It’s very easy to think “wrong” when it comes to setting up goals for a period of time. I remember my first goal when I started my own blog. It was to write 2-3 blogposts every day. Like you say, it’s a stupid goal and nowadays I focus on to write quality posts instead of quantity. The problem is being realistic and optimistic at the same time. Being positive, with an attitude. You want to reach that goal and you reach it. But… can you “really” reach it? If you honestly know you can reach it focusing on it and with your skills, then it’s realism with optimism. If you try to reach higher goals, you can fall from the mountain and the impact will be hard. lovely post ! I really love your concept. Goals should be never tangible. The number will never serve purpose. One should only COUNT number of short term goals achieved to reach one long term goal. 2011 has been a hard time for my business. But, we were able to get over it, thanks for the help of my team. So, this 2012 I’m really focusing on our goal, Important metrics must be considered carefully before making a move. Anything, Thanks for sharing the article, it was nice reading it. It has reminded me of the things I must do. Great info as usual, especially the point about the difference between targeted (interested in) traffic and normal traffic, so to speak. I’ve seen it on my website. You’re actually right. We should have the “right” kind of goals because having those goals in mind will surely come in handy when we’re dealing with our business. It’s important for us to have a vision as to where we want to be business-wise, without it our road to success might get a little blurry. Lastly, we have to be realistic. Because out-of-this-world-goals are going make us fall on our butts and end up wasting our efforts and time. People have been conditioned to focus on being constantly busy and metrics based on quantity. Consultants and agencies are in a catch 22 because often their customers insist they WANT what is not good for them. Those who will slow down and do the right things at the right time will get much better results. Timing, placement, quality and targeting will result in what is truly important: increasing conversions. Even bloggers should be thinking about conversions – whether that is clicks on advertising or affiliate, ebook, or other product sales. The more targeted your traffic is the more interested they will be in what you’re doing and the higher your conversion percentages will go up. That goes double for ecommerce sites that are losing Google traffic because of the Panda update. My Blogging Collaborations post has links to why geo-targeting makes sense for bloggers and much more on how bloggers who support each other’s efforts succeed much faster. I see you’re using KeywordLuv and CommentLuv. If your blogs are DoFollow please add their information to Bloggers: Promote Your Blog Here so I can make sure I get you on my lists and let you know about opportunities in your niches. My 2012 goals are big. I have huge goals for my offline life (getting licenced as a merchant seaman and travel more ) and for my online projects. To bad i don’t know how i will split myself though. I guess I have learned from my 2011 goals and had it failed when I had given my business a try. I hope my 2012 will be a fruitful and successful one. Dont set higher goals, find goals that you know you can reach, and has reached near before that, focus on local community, thats what I have done, and it worked. I am looking forward to reading your stuff on how bloggers who support each other succeed faster. That seems to make a lot of sense to me, because getting that first supporter is probably the most challenging part.